1. Score ham by making diagonal cuts in a diamond pattern. Place ham on rack in shallow roasting pan. Bake in preheated oven at 325°F for 1 hr., 30 min. to 1 hr. 45 min. or until meat thermometer registers 140°F. 2. Meanwhile combine remaining ingredients in medium saucepan. Bring to boil; reduce heat. Cook and stir for 2 mins. longer. 3. Remove from heat. 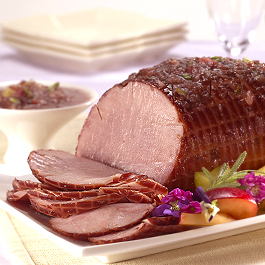 Brush ham with sauce every 15 min. during last 30 min. of baking. 4. Remove to serving platter and tent with foil. Let stand 15 min. Brush with sauce. Carve and serve with remaining sauce. If desired, garnish with green onion flowers, wedges of fresh plums and unpeeled pineapple. Makes about 24 servings.